During the marathon weekend, I decided to take it easy (and every weekend from now until June because I hate winter). I stayed in and cleaned my apartment a bit and put some unnecessary items on Craigslist. I worked on learning how to use the video editor installed on my computer and I sat on Twitter for practically 20 hours total. I've decided that instead of becoming a reclusive author, I'd like to become a reclusive Tweeter. I was up until about 3:00 or 3:30 a.m. last night, I just never got tired. I was up finishing stuff up around my apartment. This morning I woke up around 6:40 a.m. (yes that is 3 hours of sleep). 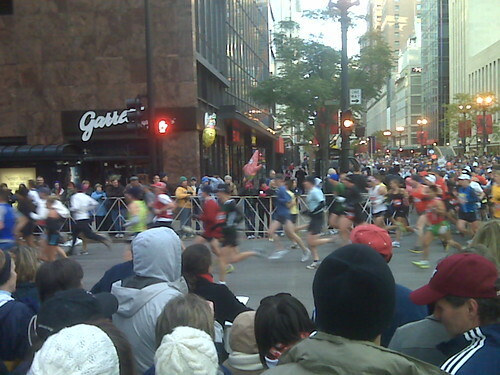 My friend Charles phoned because we were going to watch his wife run the marathon. I picked Charles and his daughter Taylor up and we headed to the starting line. 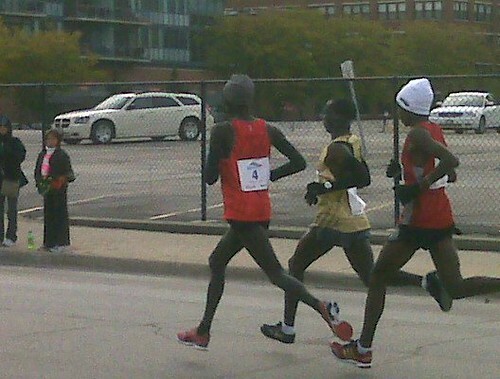 We were too late, the race had started so we rushed to the 2nd mile marker. At the second mile marker and never saw her. After that we raced back to Charles' house and grabbed two of his other kids (Charlie & Lulu) and headed to Morgan and Monroe, still were not able to see Erica (Charles' wife) but were able to see the pack of the first three leaders in the marathon, that was pretty cool. 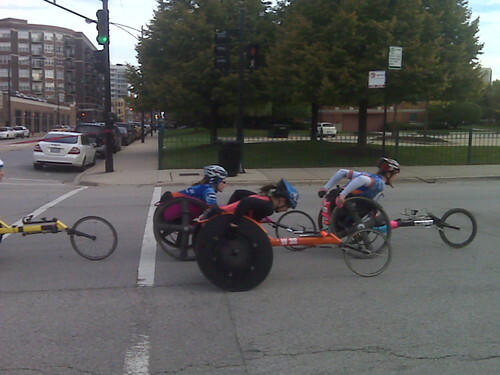 We were also able to catch the Wheelchair racers, something I had never seen before so it was exciting.